The lack of investor support for the HUN/Clariant deal after the dust settled yesterday may come down to one of the risks that we raised in our short initial commentary – complexity. Given the lack of business/product overlap, the companies run the risk of taking two businesses in a variety of hard to understand and model chemistries and markets and simply making something more complex. We see risk to the downside for both names – even with the benefit of the synergies. We have done exhaustive work on business complexity and the increasing discount that the market has been applying to companies that are hard to model. A complex business delivering consistent strong growth can get the benefit of the doubt and can often trade at a premium to peers. A complex business with earnings disappointments or volatility generally finds declining investor interest. This is the bucket that the new company will fall into. Using our tested complexity measure we find that a combined HUN/Clariant will likely hold the title of the most complex materials company in Europe and North America. The company is likely to have seven different reporting segments each with very different chemistries and even if it decided to regroup into fewer segments the complexity remains. There are few, if any, more pure play proxies to help investors model businesses. The onus is now firmly on the companies to address these issues – most investors do not have the time to research each business and its drivers (both supply/demand and risk of commoditization). Investors could move their money to easier to understand stories. This has happened with Eastman in the US as the company has missed objectives. HUN has had a significant run this year – up 37% year to date. Clariant has a slightly better longer-term story – it did not suffer the TiO2 dip that impacted HUN in 2015/16 – but is also up 27% year to date – Exhibit 2. Better economic growth, especially outside the US, so far in 2017 has boosted many companies in the chemical sector as has the step up in M&A and expectations for more. 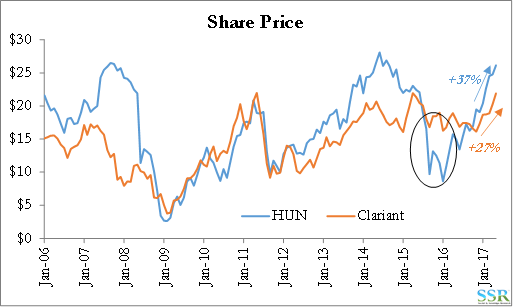 Clariant has become one of the more highly valued chemical companies in Europe and has outperformed its peer group – Huntsman has lagged. The lack of movement in the stocks since the announcement of the deal may simply be disappointment on both parts that neither company was able to find a buyer willing to pay a premium, as in Bayer/Monsanto or PPG/Akzo. The harsh reality of the business today is that in many of these complex portfolios there are business lines that are increasingly under attack from changing trade flows as production in China accelerates and this raises the risk of overpaying for business that might be subject to rapid commoditization. Neither Dow nor DuPont was going to find a “premium” bid from a third party – hence the merger of equals. PPG can pay up for Akzo, as coatings is not a global business, it is more regional – as are many of the chemical businesses at Akzo. This is largely because there is a large water component in the products, making long distance shipment uneconomic. China can compete in the pigments (TiO2) but not the paint itself. Air Liquide paid a premium up for Airgas because this too is a regional business – PX and Linde have elected to merge, sharing synergies with both sets of shareholders but both PX and APD could probably have made an acquisition case for LIN at a premium. Bayer/Monsanto looks like the bigger risk as it is unclear what will happen to crop chemicals and seed prices – especially with the ChemChina/Syngenta combination. An inability to find someone willing to pay a take-out premium – especially for HUN. 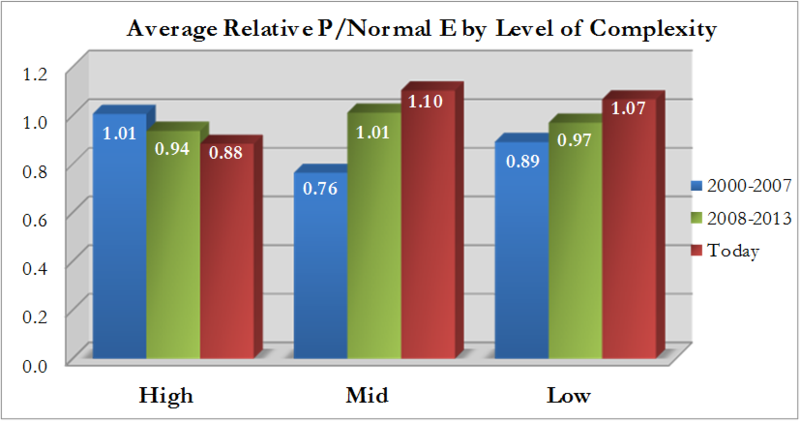 The need to find a way to offset slow top line growth through combination synergies. A collective view that a broader portfolio is better – we disagree and counter this argument below. In the case of HUN, an exit strategy for the Huntsman family. With the larger company and broader share base, the family can likely sell down its stake over time more easily and without being seen to lose faith or interest in the “family business”. The family has been interested in an exit strategy for years, agreeing to a deal with Apollo in 2007 which subsequently fell apart during the financial crisis. While investors might rightly question the level of purchasing synergies the companies discussed (especially given the lack of business overlap), we believe that the bigger problem going forward could be complexity and difficulties in modeling the combined business. Clariant holders likely have little data on the Huntsman business lines and vice versa. Equally problematic is that there are few proxies that investors can use. If we remove the pigments business from HUN – Exhibit 3 shows the EBITDA for each company and then for the combined company over the last 10 years. The volatility is clear, suggesting that the new company cannot simply play the “trust us, we grow consistently” card. During that 10 year period Clariant has re-segmented its business three times, partly due to portfolio moves, while HUN has been fairly stable. In Exhibit 4, we show the business mix of the combined company with a brief description of each business line and its core chemistries. 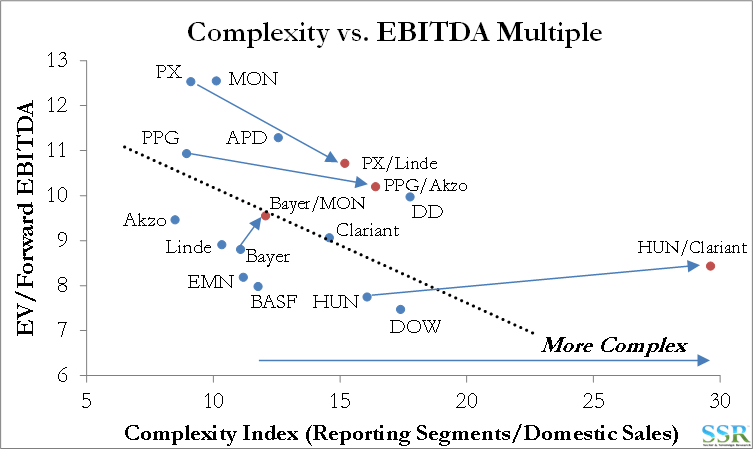 We began writing research on business complexity almost 5 years ago and at the time showed that more complex companies were seeing a reduction in the relative multiples that the market was willing to pay – the original summary chart from that work is shown in Exhibit 5. 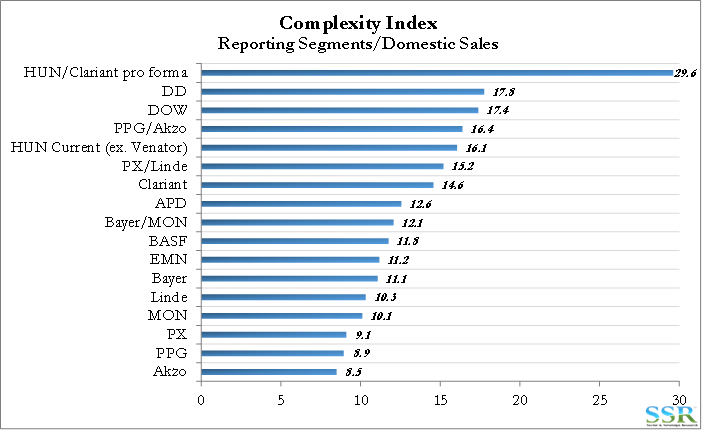 The definition of complexity is somewhat subjective in that we divide the number of reporting segments by the proportion of sales in the home country or region – the more segments and the more geographically diverse, the harder to model – the more complex. This methodology misses a lot at a granular company level, but gives the general trend. For example, Eastman (EMN) recently reduced its reporting segments by 2 – choosing to consolidate. This impacts our index and makes EMN look less complex, but the reality is that the company is now harder to model because of more limited disclosure. We also have a “rule” that has served us well over the last 20+ years. Generally, what they are trying to hide is a business or set of businesses that is commoditizing faster than expected – re-segmenting makes it almost impossible for investors to generate consistent trends for a segment or business within a segment. As shown in Exhibit 1, the combination of Huntsman and Clariant produces a very complex company. Even if the companies reduce the reporting segments, they have clearly indicated minimal business overlap, making it hard to see how re-segmentation would help manage the business. Reduced MON’s EBITDA multiple by 2 points to reflect the deal premium. Increased DD and DOW EBITDA by $1.5bn each to reflect the expected deal synergies. DOW – with the benefit of deal synergies sits well below the trend, while DuPont is above. We have not modelled the combined company, which would clearly be more complex, as the expected separation would likely create three companies less complex than either Dow or DuPont today. Today Clariant sits on the best fit line, while Huntsman sits well below it. In Exhibit 7 we keep the original trend but we add the new combinations to the chart assuming that all deals go ahead. We have made segment consolidation assumptions where they make sense – so for PPG/Akzo we only add one segment – chemicals – for example, but we add much more geographic diversity. 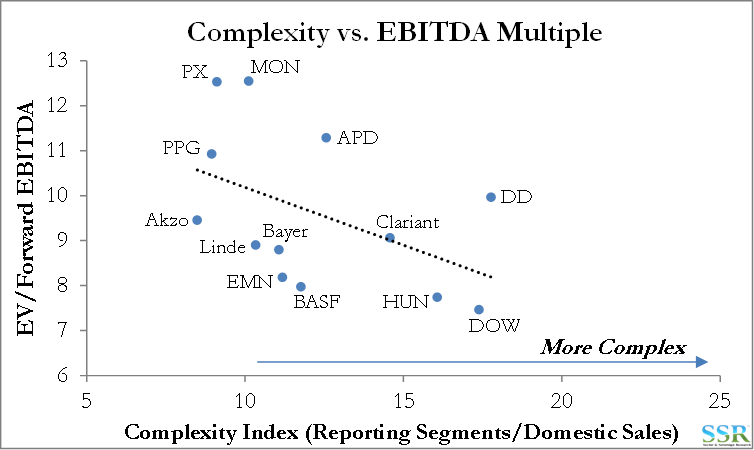 Huntsman/Clariant is the outlier on the complexity front and the pro-forma sits above the trend line. 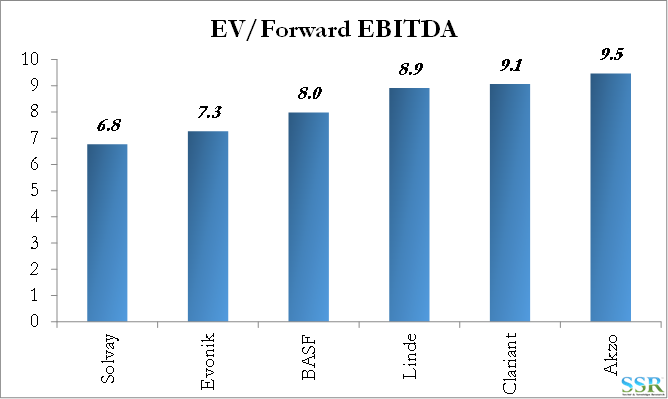 If we assume that the combined company trades at an EBITDA multiple suggested by the trend (and we give the combination the full benefit of the cost synergies – but not the purchasing synergies) there is significant downside. However, there will likely be a flor multiple, as there has been for Eastman and if we assume that to be HUN’s current multiple there is 6-10% downside to share prices. 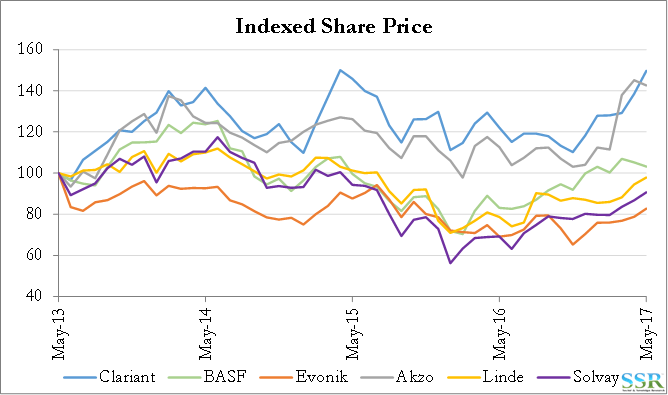 Clariant has been one of the better performing chemical stocks in Europe over the last 4 years (Exhibit 8) and currently trades at a relatively high EV/EBITBA multiple – the highest in Europe among its peers if you take out the deal premium in Akzo (Exhibit 9). Earnings growth has been poor, but that is similar for all European companies, given the weak economic backdrop. 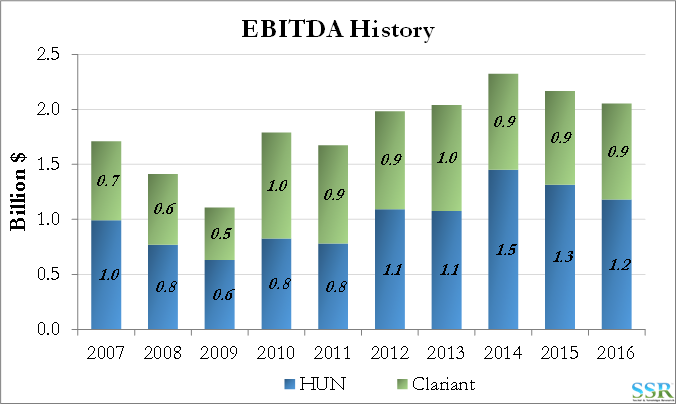 If combining with Huntsman only brings head-office synergies but adds complexity, it is unclear what Clariant shareholders gain from the deal – some earnings but higher risk.